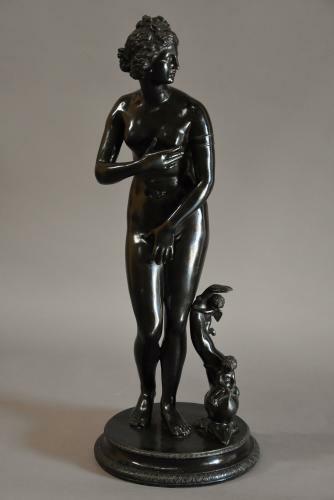 This bronze depicts Venus, her hands covering her body for modesty with a dolphin at her feet, the dolphin with two cherubs aloft supported on a circular base signed 'Fonderie Giorgio Sommer Calabritto 2-3 Napoli', this is a fine casting and has good dark patination. The Sommer foundry in Naples produced various Classical bronzes in a range of sizes. The original marble figure Venus de Medici was a life size sculpture of the Greek Goddess of love, Aprodite, having just emerged from the sea, the dolphin at her feet being a symbol of this, the original sculpture was originally recorded in 1638 at the Medici Villa, Rome and is now in the Uffizi in Florence, Italy. The Italian sculptor and bronze castor Massimiliano Soldani-Benzi (1656-1740), cast a bronze copy of the original marble 'Venus de Medici' for Prince Johann Adam Andreas I von Lichtenstein and worked on the figure between 1699-1702 - this figure remains in the Lichtenstein Collection in Vienna, Austria. A large bronze example of the 'Venus de' Medici' can be seen in the garden of the National Trust property 'Anglesey Abbey' in Cambridgeshire, UK. This bronze is in excellent condition and can go straight into a home.